'Percenta Nano Glass & Ceramics Sealant' is a coating material at a nanotechnology level. Aqueous and oily liquids are simply repelled. Contaminants and limescale can be easily removed from sanitary ceramics or household glass. 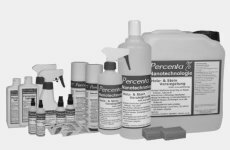 'Percenta Nano Glass & Ceramics Sealant' can be applied on washing basins, showers, bathtubs, bidets, toilets etc to protect against contaminants and bacteria to increase the standard of hygiene. The product develops an invisible film on the surfaces and can also be applied on glass shower screens. Time and effort spent on cleaning, as well as the use of additional cleaning agents, will be reduced. 'Percenta Nano Glass & Ceramics Sealant' has been developed so that surfaces only have slight contact with particles of foreign matter. Through aqueous and oily liquid repellency, foreign matter, such as oily substances, limescale, algae etc are prevented from adhering to the surfaces. Even dried out dirt and limescale can be removed easily after the prior treatment with our glass & ceramics sealant. 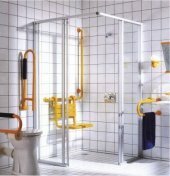 Ideal for all hygiene sensitive areas, such as nursing homes, hotels, guest houses, hospitals etc and all food storing and processing areas. Limescale and toothpaste often settle on washing basins, which can only be removed with a lot of effort and chemical cleaning agents. Grease, limescale, toothpaste and other contaminants can simply be washed off with water and a wet cloth, after the prior treatment with our 'Nano Glass & Ceramics Sealant'. The use of additional cleaning agents almost becomes redundant. Limescale, urine stains and other contaminants are very hard to remove and don't look very nice. After a treatment with our 'Nano Glass & Ceramics Sealant', such contaminants can no longer adhere to the surface and can simply be removed with water and a wet cloth. The use of additional cleaning agents will be reduced. Wall tiles do not need to be cleaned very often, but also get stained and dirty, with, for example: spilt water or toothpaste, which are difficult to remove. In this case, with the prior treatment with our sealant, such stains can simply be washed off with water. Almost every glass surface around the house, for example mirrors, interior window surfaces, glass shower cubicles, glass shelves or glass cabinets, can be sealed with our 'Nano Glass & Ceramics Sealant'. Nicotine, grease, dirt and oil cannot adhere to the surfaces anymore, and can simply be washed of with water and a damp cloth. Time and effort for cleaning, as well as the use of additional cleaning agents, will be reduced and these are only two advantages of our product. Shower and bathtubs often show limescale and water remains. The floor will not become slippery after applying our sealant. Saves on time and money for cleaning.